TommyWonk: Bumper Sticker Economics: Do Deficits Matter? Bumper Sticker Economics: Do Deficits Matter? 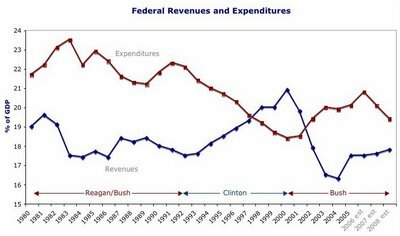 The Clinton era gave us four consecutive budget surpluses and the prospect of budget surpluses "as far as the eye can see." But that was too good to last. George Bush came into office and started cutting taxes. Revenues plummeted while expenditures climbed. The OMB projections show a drop in the deficit in the next several years, based on sharply lower federal spending--which hardly seems realistic to me. "We won the midterms. This is our due." The situation is much like when Clinton took office, with a lackluster economy, lingering deficits, and large debt. 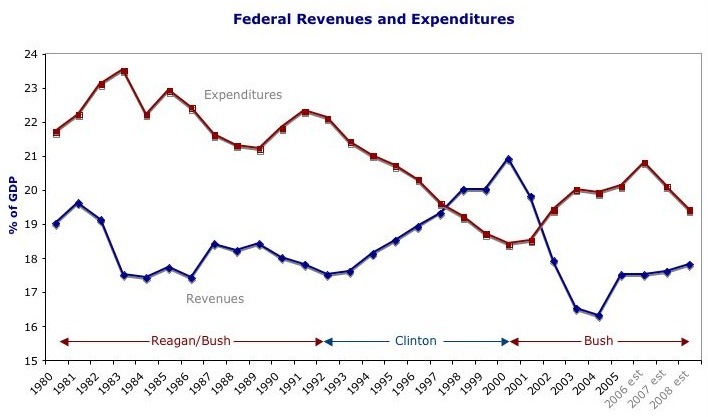 The graphs suggest the Clinton/Rubin approach would work again to repair the damage: Control the growth in spending while boosting revenues with modest tax increases. Target the deficits so the Fed can keep interest rates low. However, a repair effort now would face challenges the Clinton team did not: The debt is larger. The spending on Iraq won't go away overnight. The baby boomers are retiring. And oil prices aren't going down anytime soon. One disagreement: I wouldn't call the economy lackluster with 4% GDP growth per quarter. One agreement: It will definitely be more challenging for every successive president as more and more baby boomers retire and entitlement spending skyrokcets. The United States is heading for bankruptcy, according to an extraordinary paper published by one of the key members of the country's central bank. A ballooning budget deficit and a pensions and welfare timebomb could send the economic superpower into insolvency, according to research by Professor Laurence Kotlikoff for the Federal Reserve Bank of St Louis, a leading constituent of the US Federal Reserve. Prof Kotlikoff said that, by some measures, the US is already bankrupt. "To paraphrase the Oxford English Dictionary, is the United States at the end of its resources, exhausted, stripped bare, destitute, bereft, wanting in property, or wrecked in consequence of failure to pay its creditors," he asked. According to his central analysis, "the US government is, indeed, bankrupt, insofar as it will be unable to pay its creditors, who, in this context, are current and future generations to whom it has explicitly or implicitly promised future net payments of various kinds''. The budget deficit in the US is not massive. The Bush administration this week cut its forecasts for the fiscal shortfall this year by almost a third, saying it will come in at 2.3pc of gross domestic product. This is smaller than most European countries - including the UK - which have deficits north of 3pc of GDP. Prof Kotlikoff, who teaches at Boston University, says: "The proper way to consider a country's solvency is to examine the lifetime fiscal burdens facing current and future generations. If these burdens exceed the resources of those generations, get close to doing so, or simply get so high as to preclude their full collection, the country's policy will be unsustainable and can constitute or lead to national bankruptcy. "Does the United States fit this bill? No one knows for sure, but there are strong reasons to believe the United States may be going broke." I read somewhere that if the Sarbanes-Oxley requirements were applied to the federal government, the balance sheet would show a deficit of $37 TRILLION, thanks almost entirely to outlays related to Social Security and Medicare. I believe that's what he means by a "ballooning budget deficit and a pensions and welfare timebomb could send the economic superpower into insolvency."